While Boston University students leave campus for Thanksgiving recess, four varsity teams — both basketball and hockey teams — will continue playing during break. Women’s basketball and women’s hockey will play Tuesday night games. Hockey will be traveling down Commonwealth Avenue to face rival Boston College at 7 p.m. in Conte Forum, three days after closing a series of matches against the University of Vermont at home. The Terriers (3-3-4, 3-3-4 Hockey East) earned their first shutout of the season — and sophomore goaltender Corinne Schroeder’s first of her collegiate career — with a 3-0 decision against the Catamounts (2-7-4, 2-6-2 Hockey East). Vermont then forced a 3-3 tie in the following match. BC (10-3-0, 7-1-0 Hockey East) is ranked fourth in the NCAA and is coming off of a weekend series of its own, shutting out the University of Connecticut 3-0 Friday in Storrs, Connecticut, and 4-0 Saturday at Chestnut Hill. Durocher said that as the season progresses, the team has settled into its play but still needs to be prepared for an opponent like the Eagles. Women’s basketball will start a three-game homestand Tuesday against Bryant University. Friday, the Terriers (1-2) dropped 57-68 against Marist College despite three players sporting double-digit production. 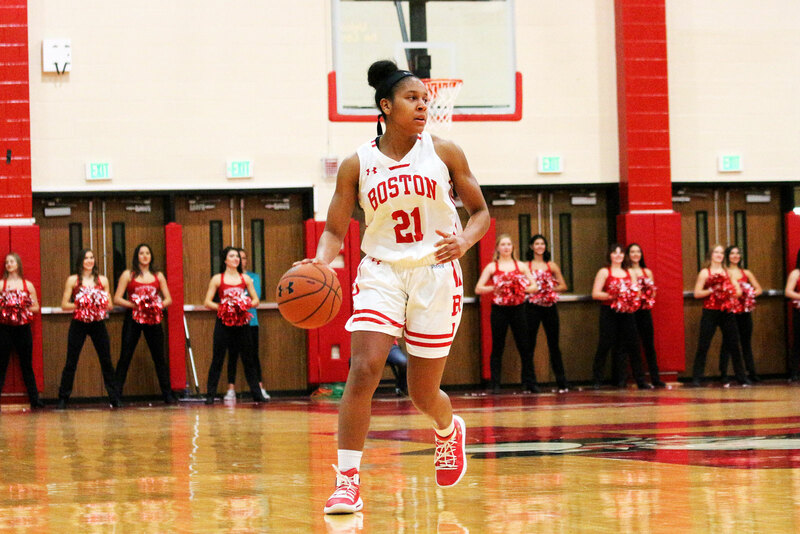 Junior forward Nia Irving led the team with 16 points while shooting at .600 percent. Senior guard Lauren Spearman produced 12 points and leads the Patriot League with 3.7 3-point field goals per game. Bryant (2-2) will also enter the game off of a 48-94 loss to No. 25 West Virginia University. The loss came in the hometown of the Bulldogs’ leading scorer, junior guard Sydney Holloway. The native of Morgantown, West Virginia, averages 19.3 points and 12.8 rebounds per game. Men’s basketball also follows up a loss against Eastern Michigan University. After keeping games close or winning easily in the first week of the season, BU head coach Joe Jones said he is not letting one game affect the next. The team will play Drexel University on Wednesday and Rutgers University on Friday to continue its six-game road trip. Drexel (2-2) won its most recent match against La Salle University 89-84 during which the permanent lead came from graduate guard Trevor John, who is tied for first on the team with an average of 14.5 points per game. Rutgers faced Eastern University (4-2) Monday, where it beat the Eagles 63-36, before returning home to host the Terriers (3-2). The Scarlet Knights (3-1) won their first two games on the season, including a 95-66 win over Drexel. The men’s hockey team will also be on an away series, facing the University of Connecticut and either Union College or Yale University while participating the Friendship Four based out of Belfast, Northern Ireland. UConn (5-6-1, 2-5-1 Hockey East) has gone 1-4 in its last five games, concluding with a shutout by the University of Massachusetts Lowell. The Terriers (3-5-1, 3-3-1 Hockey East) broke a three-game winning streak against the University of Maine Saturday, following their 3-2 win over Maine the day before. Nick Telesmanic and Dylan Woods contributed to the reporting of this article.